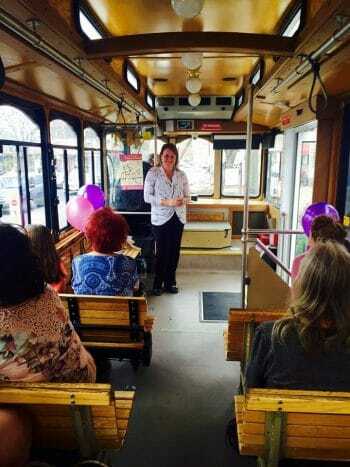 Remi, trolley- hosting visitors to town during a recent Downtown Event. A resident of Haddonfield, Remi Fortunato, our retail coordinator, is also a former downtown Haddonfield business owner. This experience brings an added perspective to her position. She has first-hand experience regarding the benefits and appeal of being a Haddonfield business owner, while also understanding what might appeal to shoppers visiting the downtown. Remi began her career on Wall Street after graduating from Fairleigh Dickinson University. Her entrepreneurial spirit led to the opening of Remi’s Café on Kings Highway in 1991, (Home of “The Little Tuna”, today) which operated for 11 years. Fortunato was a member of the Haddonfield Business Association from 1991-2002, and is a longtime and frequent supporter of many local charitable efforts and events.